Author's Note: Many on-line folks were involved in the creation of Warrior Stars , so I want to be clear about my connection with the book. I was not involved in the writing of any portion of Warrior Stars . I know a number of people who were, and my web site and Whoosh! were recommended sites in the Internet chapter (I did not know about those in advance -- surprise! surprise! ), but that's the extent of my involvement with the publication. Editor's Note: Some Whoosh! staff members (but not all assisting with the book) received monetary benefit for services offered to the production of this book, including the editor-in-chief, Kym Masera Taborn, who received an honorarium for assisting in the proof-reading of the book. Nikki Stafford's book involves the fans more than any other available at the moment. What is to be found out there? The Official Guide , The Unofficial Guide , X-Posed , and Warrior Stars . It was inevitable. Given all the popularity Xena: Warrior Princess has been enjoying and all the press and merchandising that has flocked around it, books were bound to start appearing about the show and its stars. Which ones are worthwhile for a fan to own? To what extent do all these books just say the same thing? So far, four books have been released. The Official Guide and Warrior Stars are the only two that I own, so my information on the others is second-hand and bookstore thumb-through impressions. Nonetheless, here is what I can tell you about the others before going into the newest offering, Lucy Lawless And Renee O'Connor: Warrior Stars of Xena . Rob Weisbrot invested his own time and money in his book, hoping it would be picked up. The Official Guide To The Xenaverse is the certified, sealed-with-a-kiss-from-Universal Xena book. It is a very good one. More than just a rah-rah repackaging of PR releases, it spends time doing the things that the unofficial books will never get to do: it sits in on script readings, editing sessions, casting decisions, and presents XenaStaff responses to episodes. It gives us a tour behind the scenes of the show, chats up the stars and staff, and even gives us Lucy Lawless' reactions to each of the episodes through second season. Where does that leave the unofficial publications? There are many things books can offer without getting behind-the-scenes juice. An unofficial book has to be judged on what original content it can offer about the show. That content may be humor, commentary/criticism, analysis, or just a compilation of information in a new and interesting way. Those services can make an unofficial publication fascinating and fun for readers. The lack of those services make books into rip-off scams with their authors and publishers simply trying to make an easy buck off the efforts of a show's creators. The Van Hise book doesn't rate very highly. 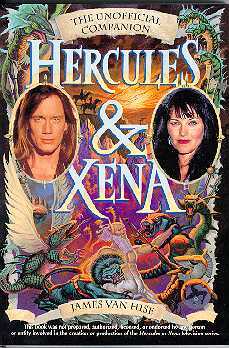 The Unofficial Companion provides general information about both Hercules and Xena and their stars. The photo section is worth browsing in the bookstores for the picture of Lucy in her Mrs. New Zealand days and for a picture with Garth Lawless, Daisy's pop, both of which I had not seen before. But considering that the caption for the family picture names Daisy, "Caitlin", I have no confidence in the accuracy of this book at all. It stayed on the bookstores' shelves. Where Does " Warrior Stars " Fit In? Warrior Stars concentrates largely on online fandom. Mary Dragonis, who offers montages of the show on her web site, did the cover of the book. Photos are almost entirely fan photos taken at conventions and other public appearances, and some of the chapters were written by active online fans. This is a good example of a way that an unofficial book can go beyond what official publications offer and tackle new subject areas. This is where the compilation of previously published information is most evident: I saw at least a dozen sources pieced together here. This is not necessarily a bad thing. Granted, most of what I read was "seen it, read it, know it already", but it is no simple feat to splice that all together. The biographies are not the strongest parts of the book, but the overview of the stars is still of interest. 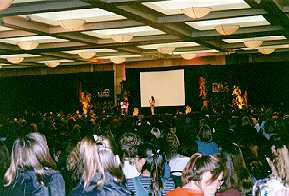 It was a packed house at the 1998 Burbank convention. Lucy is the dot on stage. 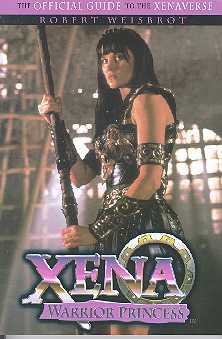 The biographies include complete transcripts of Lucy Lawless' January '98 convention appearance in Burbank and Renee O'Connor's October '97 appearance in Valley Forge. This is one of the few spots where the book might have permission problems. Creation does not usually condone recordings of their events, and a transcription is probably just as no-no as video or audio. Sure, some of us were lucky enough to catch Grease when Lucy Lawless performed in it, but how many saw it 16 times? Bonnie Fitzpatrick, Queen of the Eugene O'Neill Theater, gives a great overview of Lucy Lawless' Broadway visit, including how the performances changed over time and some of the special nights along the way. This was one of those chapters that did not contain anything I had not heard online already (Bonnie had already posted this), but it will be of special interest to fans who did not get to hear it before. 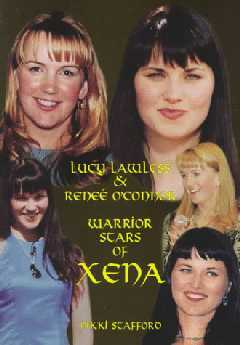 Want a starting guide to the fan clubs, mailing lists, and prime web sites for Xena and all its stars? They are listed here. This information may go out of date quickly, especially the email addresses and web site URLs, but for the moment it is useful to people who are new to the online community or want to find out more about their favorite stars and recurring guests. The fan clubs and mailing lists include introductory blurbs by their administrators, and about twenty web sites are recommended to get you off and surfing. This is an interesting combination of two online entities into a new whole: a very small sampling of the Encyclopedia Xenaica illustrated by Jeanette Atwood of the Battle On cartoon. This is a great combination, and they chose good phrases to introduce people to some of the favorite lingo and people, and the illustrations are funny additions. The creators of these two Xena icons should think about working together more often. This was probably my favorite new content chapter, guest-written by Debbie Cassetta (aka Mistopholees in many online spots and a fellow Whoosh! staff member), about Meow Mix, the show's subtext, and the Lesbian fan contingent. The chapter talks about the history of subtext awareness, the celebrations of it in places like the Meow Mix bar in New York City, and the reaction it has gathered from the public, the XenaStaff, and the press. It is a clear-headed look at a topic that tends to be muddled in sensationalism, rumor, and emotion. How Well Have You Been Paying Attention? After reading all that info about the show, you get a chance to try answering a hundred questions to prove how well you know your stuff. It is a good trivia quiz: fun nit-picks without getting ridiculously obscure. I only caught one, maybe one and a half answers that were wrong or with which I did not agree. I scored a 94 out of 100, which does not earn me a Warrior Princess rank, but does make me an Amazon Princess, which, to misquote Bill Cosby, is where I wanted to be in the first place. This is the major chunk of original content. The book covers episodes up to THE BITTER SUITE (58/312) with a two-line summary, a critique of the show, and notes on favorite bloopers, inconsistencies, a report on Gabrielle's fighting skills, and episode disclaimers. I disagree with a lot of the opinions and, in some cases, have resolutely stated the exact opposite of what is in this book, but that is part of the fun of commentaries. The opinions are stated well and bring up some interesting ideas. There is a lot of information about myths and legends that relate to the episodes. In some cases, the relationships are only something as tenuous as a shared name, and the book tries to draw some questionable connections on those, but the background is interesting. When all is said and done, the book is worth its cost. Much of the content will be old hat to avid Internet surfers, but even for them, it provides enough original content plus convenient packaging of the old stuff to be worth picking up, and for those who have not spent quite so much of their lives in front of the monitor screen, it is a great compilation of information, particularly about the fan community. There's another issue beyond whether an unofficial publication is worth the printing: there is also the nagging idea that it is enjoying popularity and making its money off of someone else. Even when the product being offered is a valuable source of original comment, criticism, and humor, it is still riding piggyback on someone else's work. I want to propose something to all fans who work for profit, and it is not an original idea: give something back to the work upon which you based your product. In particular, I would like to see Xena fan book authors give back some of their proceeds to charities. That would be a great way for fan productions to acknowledge their source. The folks behind Warrior Stars have donated some copies of their book to Sword and Staff, a Xenite charity organization, which I think is a great start. I would love to see more of that from all works that are based on someone else's effort. Beth Gaynor lives in Columbus, Ohio (go Buckeyes! ), and designs courses for DPEC, a computer-based training company. Outside of the office, she is often spotted at the Columbus Zoo, where she volunteers as a docent. This usually involves answering the question "Where's the bathroom? ", although she gets breaks from that long enough to talk about the animals and help the keepers. Beth has snuck up on her thirtieth birthday with stealth that would do Xena proud and stays young and vigorous by battling for house supremacy alongside her husband against their two cats. So far, the struggle is too close to call.